Andrew M. asks: What causes Saint Elmo’s Fire? For those not familiar, “St. Elmo’s Fire” is a name for the glow that looks like blue/violet fire surrounding the top of pointed metal objects during a storm. This phenomenon can trace its name back to an Italian saint “Sant ‘Ermo” or “St. Erasmus” around 300 A.D., the patron saint of early Mediterranean sailors. 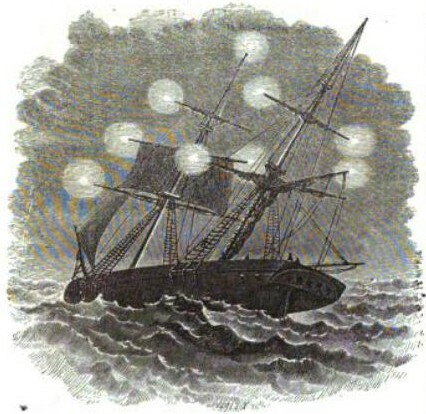 This glow tended to appear on the tops of the masts of ships during the dissipating stages of a thunderstorm. The general superstition went that if St. Elmo appeared, it was a good omen and an answer to the sailor’s prayers, as the violent seas would begin to die down and the surface winds would calm. Should he (the fiery glow) appear during times of good weather, it was said that St. Elmo’s guiding hand was warning of a storm. Everything was in flames, the sky with lightning, the water with luminous particles, and even the very masts were pointed with a blue flame. Scientifically, this phenomenon is known as a “corona discharge” or “point discharge.” It can, and commonly does, happen at the tip of any conductive surface during thunderstorms. It can be seen on the tops of church steeples, lightening rods, the tips of airplane propellers and wings, and even blades of grass and the horns on cattle! Benjamin Franklin was the first to more or less correctly describe the phenomenon as atmospheric electricity in 1749. He thought the “fire” was a way lightening rods would “draw out” a thunderstorm’s electricity slowly before it built up enough charge to form a strike. A corona can form when the potential of an electrical field (in this case the atmosphere during a thunderstorm) is stronger than the resistance (in this case the pointed conductive rods) of whatever medium the electricity (electrons) will flow through. Scientifically, this is known as Ohm’s law- electric current is equal to voltage divided by resistance. So why does this happen during thunderstorms, and why does it happen more easily with pointed metal objects? In a word (or two in this case): electrostatic equilibrium. Electrostatic equilibrium is a natural condition in which a charged conductor (as in the case of a ship’s mast) will have its excess charge distance itself equally throughout. This is because it has equal repulsive forces acting on it throughout the material. Basically, all the electrons present in the material will distance themselves equally throughout, because they all repel each other. This is important to note when it comes to pointed conductors, like a ship’s mast, and their electric fields. Electric fields will always have their force directed entirely perpendicular to the surface of the conductor. In the case of a flat conductor, this means the force is applied downward. It’s because of this that a pointed conductor will have more electrons, and therefore more charge, at it’s tip. If you take two magnets and place them on a flat surface, they can repel each other a certain distance. If you bend that three dimensional flat surface making the center point between the two magnets the tip, you will be able to slide the magnets up towards the tip, and thus closer together if the surface were flat. This is because the repelling force is applied away from the surface and not at the opposing magnet. The bent surfaces interior acts as an insulator of sorts, not allowing the force to flow through it affecting the magnet on the other side. The result is more charge on any curved surface of a conductor in electrostatic equilibrium. The sharper the point, the more pronounced the result. I know what you’re thinking. Why wouldn’t the electrons rotating around the atoms of the interior of the conductor cause the electrons to spread out further and thus not allowing the accumulation of electrons on the curved surface? The answer is another truism involving electrostatic equilibrium. The amazing thing about the charge of a conductor is that the entire charge exists only on the surface of the material and not within it. The electric field lines will only extend out from the surface and not inward. If there was a force that existed within the surface, then the electrons would have to still move around in response to that force and thus not be in equilibrium. Since they are already in equilibrium, the result is all of the charge existing on the surface. It’s this phenomenon that allows science geeks everywhere to stand unharmed inside a metal cage (a Faraday cage) while lightening bolts with millions of volts crackle around them. So now that we know conductive materials will have excess charge at their curved surfaces, let’s talk about why thunderstorms cause St. Elmo’s fire. As mentioned before, conductors have specific electric fields. Gases can also have electric fields. In this case, the gas is the air we breathe. When the atmosphere is calm, during times of good weather, its electrical field strength is about 1 volt per centimeter (depending on the exact make up of the air present). When a thunderstorm begins forming, the electric field strength will begin to increase and will continue to do so until it reaches around 10 thousand volts per centimeter. Around that point, you will get a lightening strike. It’s in that window of increased field strength above normal and before the lightening strike that you might see St. Elmo’s fire. So now let’s put what we know about electrostatic equilibrium and what we know about the increasing electric fields of thunderstorms and talk about why they cause corona’s. Clouds, in this case a cumulonimbus cloud, tend to have excess amounts of positive charge at the tops and negative charge at the bottom. While scientists are still arguing about the exact nature of why this is, the most commonly excepted theory is that it’s the result of two processes. The first is that clouds contain countless numbers of suspended water droplets and ice swirling about. When evaporating ground water reaches the cloud, the electrons are forced away from the positively charged rising droplet leaving a negative charge at the bottom of the cloud. The second mechanism involved has to do with ice. As the evaporating water rises it can freeze at higher altitudes. The ice cluster will tend to become negatively charged towards its center. As the ice swirls around the cloud, the outer, more positively charged portions are left towards the top, and the frozen portions that are more negatively charged will sink towards the bottom. The result of these two processes leaves an increasing negative charge towards the bottom. This matters in the case of St. Elmo’s fire because of how this increasing negative charge affects the earth’s surface. Normally the air around a cloud is enough of an insulator to keep Zeus and his lightening bolts at bay. In the case of thunderclouds, as the charge from the cloud increases, its field strength also increases. This can ionize the air around it making it more conductive. As the excess electrons from the bottom of the cloud begin to weave their way down through the ever increasing conductive air, it forces the electrons on the surface of the earth (or any object attached to the earth, like a building or ships mast) away. The result is a growing increase of positive charge on the elevated portions of the earth, like a lightening rod. Using electrostatic equilibrium as a precursor, we can see that an object with a pointed tip would have a relatively higher concentration of positive charge than an object that doesn’t have a pointed tip. In the end, the positively charged tip reacts with the increasing negatively charged atmosphere and an electric current is produced. Normally this process would be invisible. In the case of corona’s (no, not the beer), when the electrical field’s potential is strong enough (like at the top of a ship’s mast), electrons can be torn from their molecules. If that electron can gain enough energy to avoid being taken up by a nearby molecule (like from the increasing, or decreasing electrical field strength of a storm cloud and the air around it), the result is free electrons, positively charged ion clusters (at the surface of the ship’s mast) and the surrounding air, all colliding with each other in a form of matter known as plasma. Plasma will fluoresce with light giving life to St. Elmo and his “fire”! The color of the plasma’s glow will depend on the type of gas present. Since our air is made up of mainly nitrogen and oxygen, it will glow blue/violet.